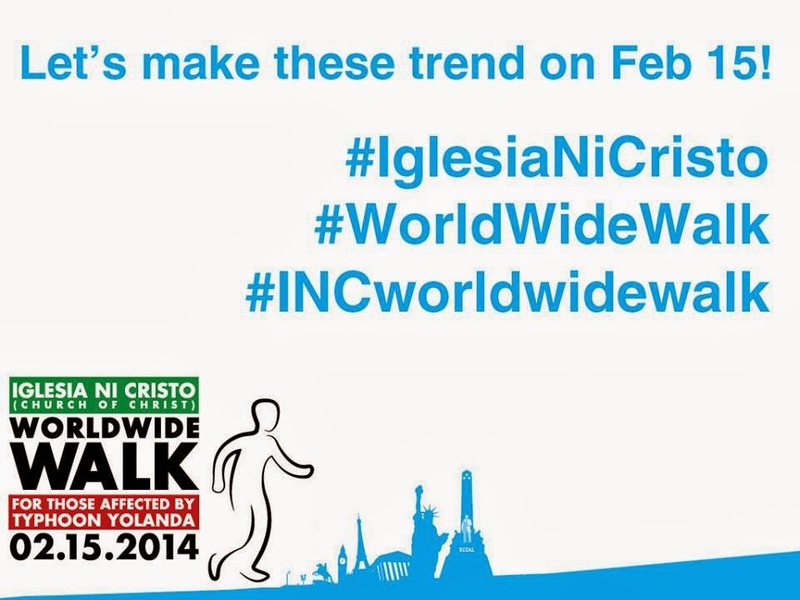 Iglesia Ni Cristo (Church of Christ) and Felix Y. Manalo Foundation will stage a simultaneous charity walk on February 15, 2014 in key cities in the Philippines and around the world. Prior to the event, participants, including Iglesia Ni Cristo members and even non-member paid a registration fee of Php250 per person (in the Philippines) and $30 (for participants abroad). All participant will receive a limited edition WWW for Yolanda t-shirts. Proceeds will be donated to those affected by Typhoon Yolanda which struck the country on October 2013 through relief operations, medical missions, and building/reconstruction of damage houses. My niece and I, together with my in-laws and churchmates in our locale will participate in this big event. My sister and her daughter in Sorsogon will be joining, too. I am sure this will be the biggest walk for the cause to be recorded in the world history. It will be a trending topic in the world wide web/ social media, too. To all #Worldwidewalk participants, see there!